More Christmas analytics tidings to share. Apps metrics provider Localytics shared a lengthy blog post earlier which suggested that plenty of good boys and girls around the globe got Apple iOS and Android devices in their stockings. Their first hint? The number of new devices that appeared on Localytics dashboard was 12 times higher than previous weekends. They also reported that there was some interesting geographical diversity, although the two platforms were mostly tied. Apple took the top growth spurt for the U.S., Germany and the UK, while the ‘Droid grew the most in South Korea, Sweden, and Spain. Source: Localytics. Among the top 20 countries for mobile devices, Localytics saw a huge increase in both Apple iOS and Android devices over the December 23 – 26 weekend compared to previous weekends since November 25. The US and Germany registered the highest growth rates for iOS, while South Korea and Sweden had the highest growth rates for Android. I’ve believed (and even expressed) for some time this will be a largely two-horse horse race, and that Android will inevitably take victory. But, the i-Juggernaut lingers on, both with the iPad and iPhone, and Google’s victory may not be as inevitable as it once seemed. Of course, these are still early days, and if you’re looking for a deeper analysis of the mobile market, and also wondering why Windows Phone 7 isn’t one of those lead horses, check out Charlie Kindel’s analysis. Having been at the scene of the Windows and OS/2 operating systems war crime, I would suggest you ought never rule Redmond out of the equation. All About Windows Phone just posted that the new Windows Phone Marketplace has now passed the 50,000 app mark, and is generating some 256 items per day. That means the Windows Phone App pace has picked up some serious steam in recent weeks, and I suspect many of those Windows Phone Apps could fit elegantly into the Windows Azure and overall Microsoft cloud/desktop landscape, particularly with respect to a lot of business applications. 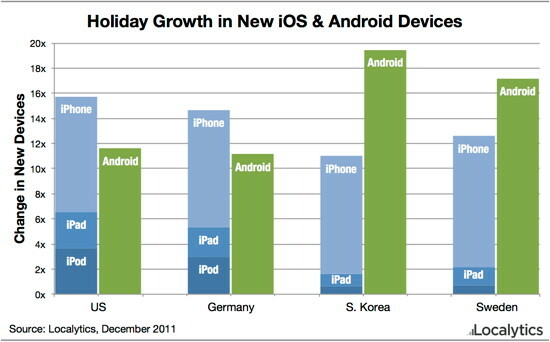 So, the net of it all is, the iPlatform enjoys continued momentum with some nice Christmas pick-up, but Android enjoys a device diversity that should keep it gaining mobile share for some time to come. Is anybody but me getting a sudden influx of Facebook SPAM? I’m suddenly getting notices from my “friends” with links to some Blogspot address asking me to watch some video. Oy vey. I wonder if that could somehow be a viral video campaign related to today’s Windows 7 launch. Speaking of which, I haven’t yet figured out how to get Windows 7 on my Acer netbook. It’s currently got a dual boot with both Ubuntu Netbook Remix and Windows XP, but because most netbooks don’t have a DVD or CD-ROM drive, upgrading is going to be a big challenge. I’ve visited both the Windows marketing pages as well as the Microsoft store, and there’s no information on the Netbook upgrade version (from which you can load via USB device, or so I had heard) of Windows 7. So, all that hard work by Microsoft on getting W7 tuned up and ready for the netbook market…well done! I did stumble onto this post from the Windows 7 blog, which announced a number of special offers and promotions, including a Windows 7 launch party in NYC. You know, I really would try and make it, but alas, I have to head to a meeting to watch some paint dry. David Pogue has a review on The New York Times with the following headline: Windows 7 Keeps the Good, Tries to Fix Flaws. But, being a technology dude, I find it is my geeksworn duty to try as many technologies as I possibly can, from IBM and from our competitors, so that I can better understand the state of the market. That said, I never tried Microsoft Vista, save for one time when I was at a Gartner Symposium in the fall of 2003, and I got to try out an early beta. I thought it really cool that Vista was going to include RSS feeds (RSS feeds were pretty new back then…amazing how so many people still don’t know what they are!) Other than that, I just couldn’t see it, especially with all the additional horsepower it required. No, for me, Windows XP was always good enough, and like so many, I never found a compelling reason to upgrade to Vista. 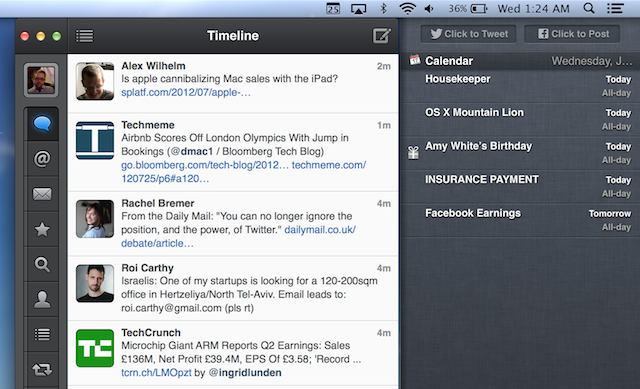 And then, I discovered Mac OS X. For my money, operating systems should be like car engines…they should just work. Turn the key. Engine cranks. Off you go. And for me, Mac OS X has been a pretty good working engine, and considering that it’s basically a UNIX derivative with a nice GUI overlay, I guess I shouldn’t be surprised. If Windows 7 can provide the kind of stability and an elegant GUI that OS X has been providing for years, then by golly, knock yourself out. I’d certainly consider putting it on my Acer netbook…but I’m definitely not interested in spending days under the hood trying to figure out how to do so. Kinda defeats the point if I can’t get in and just turn on the engine and drive.